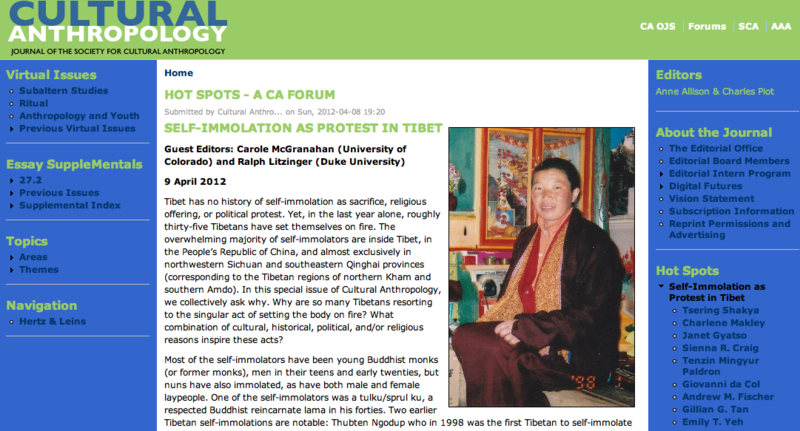 I’m a bit late in posting this here but last month, two amazing scholars Carole McGranahan (University of Colorado) and Ralph Litzinger (Duke University) guest edited a special online issue of Cultural Anthropology titled “Self-Immolation as Protest in Tibet”. In a short amount of time, Carole and Ralph were able to gather together a wealth of information, views and perspectives on the self-immolations in Tibet. The work that went into this issue is really impressive and there are thought-provoking essays by renowned Tibet scholars such as Tsering Shakya, Charlene Makley, Janet Gyatso, Emily Yeh, Woeser, Eliot Sperling and many many more. I was also able to contribute in my own small way by writing about the responses to the self-immolations by Tibetan netizens. The article is also available as a PDF, just download from this link -> HotSpot-Pemba I thought it was generous and enlightened of Carole and Ralph to invite contributions from blog editors such as from Khabdha and Tibetan Political Review. It’s really to be applauded that Carole and Ralph took this somewhat rare initiative. It’s a shame that this huge effort by scholars and intellectuals to gain some perspective on a difficult topic, both emotionally and politically, went largely unnoticed by the media. I hope that by posting about this here and also on Global Voices that many will find food for thought. For more perspectives on the self-immolations I also recommend visiting these blogposts by Mountain Phoenix Over Tibet and Lhakar Diaries.